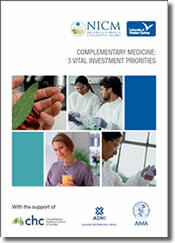 Research - How can Australia capture the health benefits of complementary medicines? Commit 1% of NHMRC project funds annually ($8m pa) to complementary medicine research priorities and capacity building 2014-2018. Innovation – How can Australia support and encourage greater industry-led investment in R&D? Establish a Working Group to consider and implement key incentives that encourage greater industry-led investment in R&D to improve productivity, grow exports and increase employment opportunities. Communication and Policy Development – How can we ensure that we support relevant national research priorities, develop appropriate policy, and that research is translated into better health choices for consumers? Seek continued matching support for NICM over 2014-18 period from government, disease foundations, private sector and other stakeholders.